With a decision of the ministry of agriculture, plant protection administration no. 3087/2018-11 Plant Primus d.o.o. Čapljinac is registered in production of seedling materials of fruits, vines, and hops, under the no. 20-040. When making an important decision about investing in hazel plants, one should know how much advantage grafted hazel seedling has over the hazel in a bush form. Basically, grafted hazel tree is using only Corylus Colurna (mečja leska / turkish hazel) for the grafting base, and that is the only kind of hazel seedling that never forms outgrowths beside the tree. That means that further exploitation of those plants are more convenient. There is no additional work like there is for hazel in a bush form caused by destroying those outgrowths. Moreover, grafted hazel tree would not use the energy on the growth of those needless outgrowths. It would rather use that energy to form treetop and fruits (hazelnut). 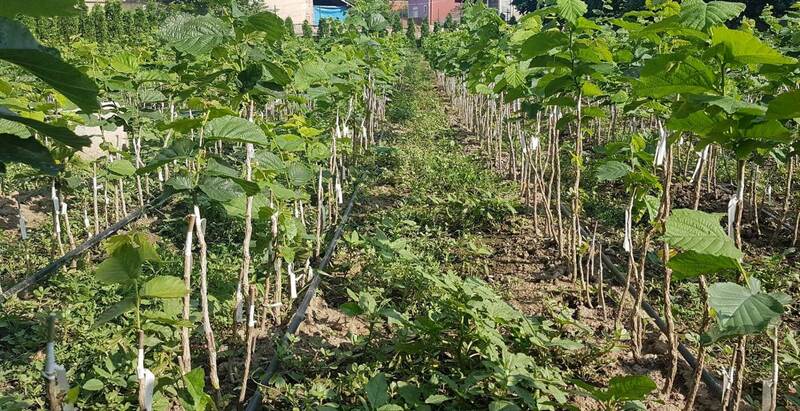 When the suggested distance in the rows between the seedlings is right, mechanization (pass) does not create a problem between the trees which have the similar form like other fruit trees. 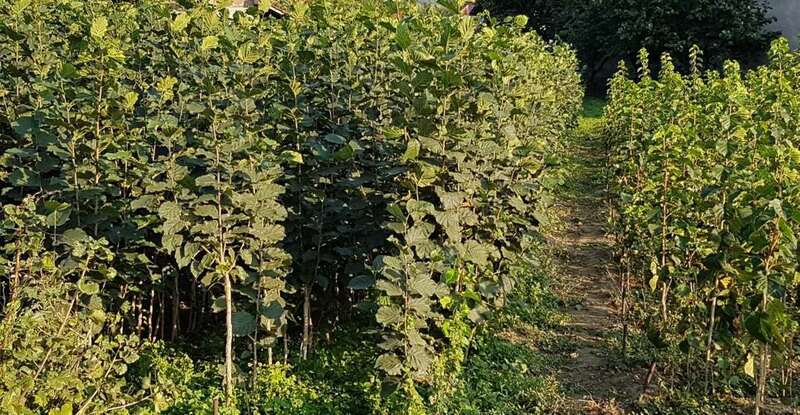 Hazel trees are more advantageous than hazel seedling in a bush form and that is why PLANT PRIMUS specialize in a production of grafted hazel seedlings. We are proud in a fact that we have been producing since 1998. 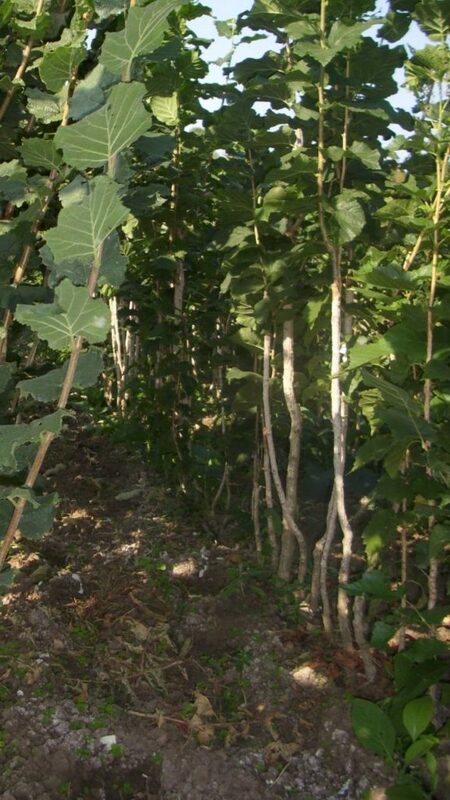 We have adapted many important details for the successful production of grafted hazel seedlings. On our website rasadnikprimus.rs you can reserve and order seedlings of grafted hazel for the upcoming season as well as get informed about the principles of successful preparation of a soil and proper planting. Spray long lasting insecticide into dug up hole (Force 1.5g or Force 0.5g). Do not cut vein roots, do it only if they are dry! It is suggested to put the seedling into dilution (Proplant 15ml + Fostonic 6g + Funomil 10g per 10l water) couple hours before planting. Right after the planting is done (preferably Nov or Dec), sprinkle a mix of FITOFERT HUMISTART-a 30ml per 10l water. After the winter, and towards vegetation season cut the seedlings in a similar height (for example around 130 cm). Due to possible frost damage do not cut seedlings earlier than suggested! When the buds are starting to show (march and april) spray seedlings with the 30 to 50 g of Fitofert Energy Root 5-55-10 and 5 l of water per seedling or 50-70 g of Fitofert Kristal 10-40-10 and 50 l of water per seedling. Also, there is a one-time-only addition of 25 ml of Fitofert Bioflex per seedling mixed with few liters of water. Furthermore, throughout vegetation period (in a couple of weeks after the start of vegetation) there is a need of a constant watering with Fitofert Berry 14-8-30 (30-50 g per plant) with addition of Fitofert Ca-NIT (20-30g per plant). Do these two mixtures separately due to incompatibility. Based on demand for the hazel seedlings on our plant for the last two years, we have got some information on the most wanted cultivars of seedlings. For now, the most wanted cultivar of seedlings is Tonda Romana (Romana Round). Following are Tonda Gentile Romana and Istrian Long with a similar percentage of demand. Furthermore, there are Ennis, Halski Giant, Istrian Round, and Lambert. 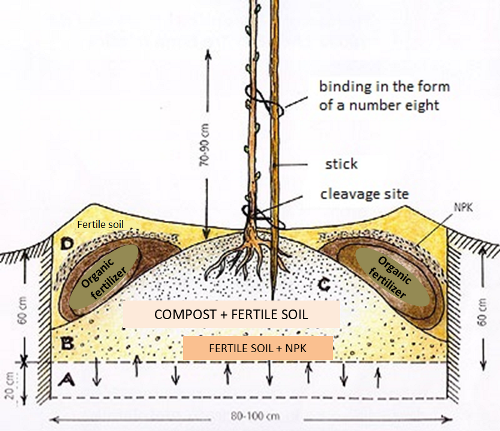 Soil analysis is a first step in a preparation of seedling’s lot. This is very important because the analysis give important information about the deficiencies of the selected lot. 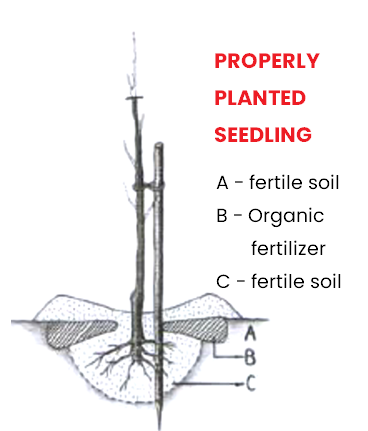 Rigging is important in the preparation of the soil where the grafted hazel is planted. This is actually deep plowing of the soil in a range of 60-100 centimeters depth. Need an advice? Call us or send us a message! Telephones: +381 64 88 22 824, +381 64 83 13 105, +381 63 88 72 868.